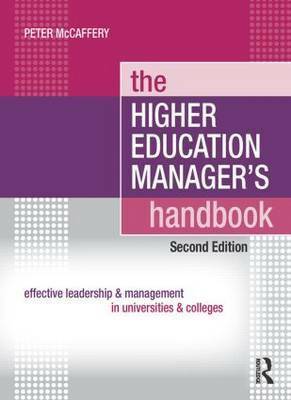 The Higher Education Manager's Handbook has been substantially updated and reflects important changes that have occurred since its first publication in 2004. In this new edition, Peter McCaffery continues to draw on a wealth of US and UK case studies based in innovative practice. The book offers counsel and guidance on all aspects of the manager's role and provides the navigational tools to successfully operate where the legitimacy of "management" has often been questioned. This bestselling guide builds upon its original strengths and remains an engaging, accessible and highly enjoyable read. Written from the unique perspective of the Higher Education manager, it offers practical advice that can be implemented immediately by managers and university leaders at all levels. It addresses the internal ramifications of cynicism and demoralisation, and develops the four essential prerequisites to becoming an effective Higher Education leader: Knowing Your Environment Knowing Your University Knowing Your Department Knowing Yourself What's new in the second edition! New chapters: "Leading and Celebrating Diversity" and "Enhancing the Student Experience" The key strategic challenges to higher education University governance Institutional financial health Universities as ecologies of learning Managing your reputation Communicating in a crisis Higher Education Managers, Team Leaders, Vice Chancellors, Provosts, University Presidents, Department Heads and Student Affairs Administrators will find this book to be an irreplaceable resource. Professor Peter McCaffery is Vice Chancellor and Chief Executive at the University of Cumbria, England.